Engineering materials may be either polycrystalline or single crystal type. A polycrystalline alloy contains an enormous quantity of fine grains. 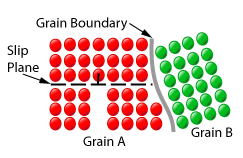 Grain boundary imperfections are those surface imperfections when ever crystals or grains of different orientation separate the general pattern of atoms and exhibits a boundary during nucleation or crystallization. This type of defect generally takes place during the solidification of the liquid metal.